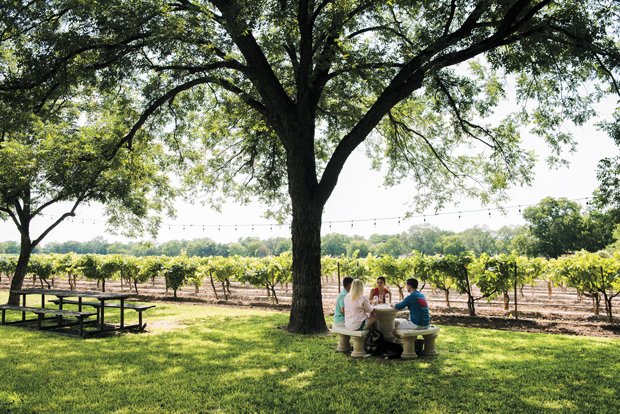 Visitors to Val Verde Winery can sample wines inside the historic production building or on the lawn in the shade of pecan trees. Wine lovers say the best wines tell a good story, each sip imparting a depth beyond the taste of the fermented grape juice itself. Tue-Sat 11 a.m.-6 p.m. and Sun 1 p.m.-5 p.m. In the border town of Del Rio, Val Verde Winery has been growing grapes and making wine near the banks of the Rio Grande for 135 years. 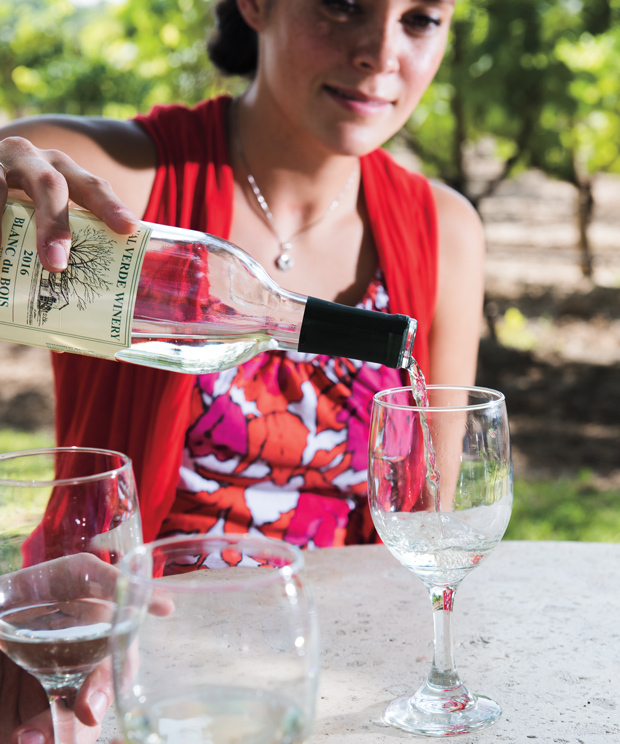 To sample Val Verde’s wines, surrounded by thick adobe walls and antique wooden equipment, is to experience a vestige of Texas agricultural history and taste the heritage of the state’s oldest operational winery. Set in a garden spot surrounded by arid scrubland, Val Verde Winery occupies the original farmstead of Italian immigrants Francisco and Mary Qualia. Their grandson Thomas Qualia and Thomas’ son Michael Qualia run the winery and vineyards today, growing Black Spanish, Herbemont, and Blanc du Bois grapes on about 14 acres bordered by towering pecan and palm trees. The winery is best known for its tawny port, but it also produces red, white, and rosé varieties using its own grapes and fruit imported from vineyards in Sonora and Brownfield. 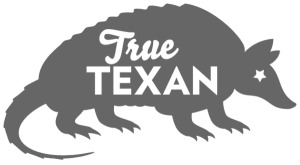 Val Verde’s wines are available at select locations in Del Rio, Johnson City, and Fredericksburg, and at Porter’s Thriftway grocery stores in Alpine, Fort Davis, and Marfa. The Qualias welcome visitors for tastings at the winery’s small facility, which different generations have expanded over the years. At the heart of the building, the yellow stucco walls of a cozy tasting room display black-and-white family photos, historical documents, and awards—an outline of sorts for the winery’s informal tours. When the weather’s nice, visitors gravitate outside to the lawn, where tables offer a place to sit and relax within arm’s reach of the grapevines. It’s easy to imagine the ancestral Italians doing just that ever since their vineyards first took root. Del Rio wasn’t the intended destination for Francisco Qualia and his fellow Italian farmers, but their trip to the New World didn’t work out as they originally planned. Framed on the tasting room wall, Francisco’s Italian passport reflects the beginning of the story. The heading declares the name of King Umberto I, and the document bears the signature of the king’s min- ister of foreign affairs. The Italians eventually found Del Rio and relocated at what proved to be an opportune time in the development of the nascent town. Francisco’s party made its way north to San Antonio, where there was already a community of Italians working to build a railroad to Victoria, known then as the “macaroni line” because of the Italian laborers. (En route to Texas, two in the immigrant party—a Ferrare and a Ferriño—stopped in Cuatro Ciénegas in Coahuila, Mexico, and started a winery that’s still active today.) Looking for land to settle as farmers, the Italians eventually found Del Rio and relocated at what proved to be an opportune time in the development of the nascent town. The Del Rio area had long been a campsite and rest stop for native tribes and early frontiersmen because of San Felipe Springs, the fourth-largest spring in Texas. In 1869, a group of early landowners formed the San Felipe Agriculture, Manufacturing, and Irrigation Company to dam San Felipe Creek and build a network of irrigation canals. When Francisco and his fellow Italians moved to Del Rio, there was plenty of land still available along the new canals to start their own farms. “Without water you don’t really have much of a settlement,” says Michael Diaz, director of Del Rio’s Whitehead Memorial Museum, a local history museum located a half-mile from the winery. “The canals brought water from the creek to different land plots for irrigation and also drinking water.” The canals still distribute water throughout south Del Rio. About twice a month, the irrigation company distributes cool, clear water, which permeates the neighborhood like a series of streams. You can see the canals running along roadsides and across properties, including a canal that runs through the grounds of the Whitehead Memorial Museum. Another key development of Francisco’s day was the completion of the Southern Pacific Railroad between San Antonio and El Paso through Del Rio. In 1881, Southern Pacific began extending the railroad west out of San Antonio and east out of El Paso. The two lines met in January 1883, 3 miles west of the Pecos River, writes Douglas Braudaway in his book Del Rio, Queen City of the Rio Grande. Spaced throughout the rows of summer and winter crops were the vines of Black Spanish grapes, also known as Lenoir grapes. No one knows for sure how the grapes made it to Del Rio, but one theory suggests Spanish missionaries planted them at missions between Mexico and California, and Doña Paula acquired cuttings for Del Rio. Del Rio’s Italian farmers seized on the crop to produce table wine as they had in their mother country. 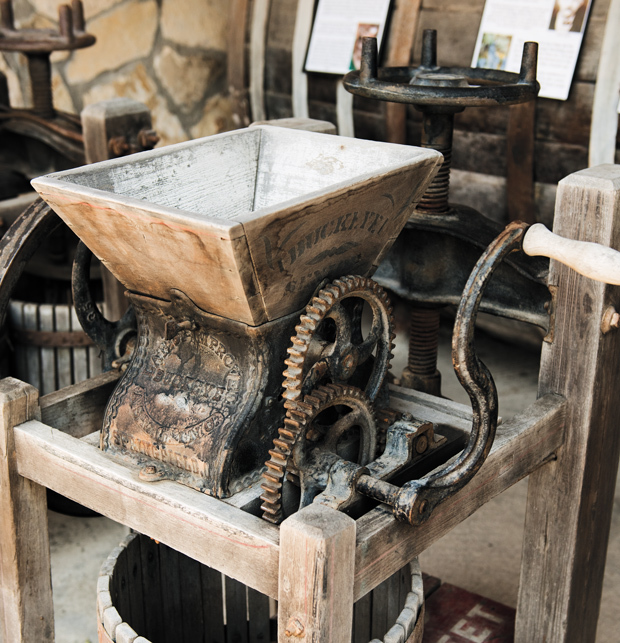 In the Val Verde tasting room, the winery displays a Qualia family 19th-century grape crusher made of wood and iron. More presses are on display at the Whitehead Memorial Museum, including an 1872 press donated by the Frankes, another local Italian family. a 19th-century grape press at the Whitehead Memorial Museum represents the type of equipment Mary and Francisco Qualia would have used on their Del Rio farm in the 1880s. When Francisco died, his son Louis (Thomas’ father) inherited the winery. Louis’ primary occupation was ranching goat and sheep, but he maintained the winery as a commercial operation and introduced Herbemont grapes, which are used to make white wines. (Val Verde cultivates Black Spanish, Herbemont, and Blanc du Bois grapes because they’re tolerant to Pierce’s disease, a damaging bacteria found in the area.) Thomas inherited the winery in 1973 and grew its production, including the addition of olive trees about six years ago. The trees have flourished, and Val Verde sells whatever olive oil the family doesn’t use. Now Michael Qualia, the fourth generation, helps manage the winery, which produces about 3,000 cases per year. Michael started the winery’s 1883 Wine Club five years ago and has expanded its tasting-room offerings with snacks like crackers, cheese, and olive tapenades. Most weekends, the winery is busy with visitors, many of them young couples from Laughlin Air Force Base.